Shaping Global Islamic Discourses – a new book from Masooda Bano challenges current assumptions about the power of Islamic movements to penetrate Muslim societies. 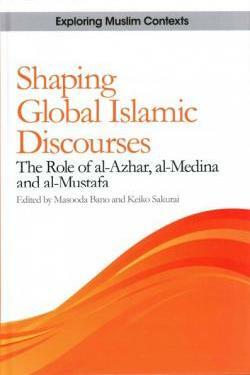 Published in March 2015 and co-edited with Keiko Sakurai, Shaping Global Islamic Discourses: The Role of Al-Azhar, Al-Medina, and Al-Mustafa investigates the complex interaction between the global and local Islam and the plurality in outcomes. Through case studies of selected academic institutions, and taking a comparative approach with cases from Africa and Southeast Asia, the volume illustrates how transmission of ideas is an extremely complex process, and how the outcome of such efforts depends not just on the strategies adopted by backers of those ideologies but equally on the characteristics of the receipt communities.